Bye bye, Loot Cave. Bungie has finally cracked down on the now-iconic exploit that players were using to get loads and loads of loot in the multiplayer shooter Destiny, which Bungie released earlier this month for PS4, PS3, Xbox One, and Xbox 360. The Hive of the holy "Treasure Cave" have realized the futility of their endless assault on Skywatch and have retired to lick their wounds and plan their next attack. The Loot Cave—a landmark on Destiny's Earth that would spawn an infinite number of new enemies—had become a popular place for high-level players to congregate and grind for loot over the past few weeks, to the point where it was something of a meme. 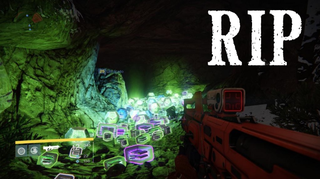 In many ways the Loot Cave served as an apt metaphor for the addictive-yet-excruciating grind of Destiny itself, as Kirk captured in his review. Now it's no more. Today's patch will also stop players from getting ascendant materials when they dismantle Queen's Wrath gear.